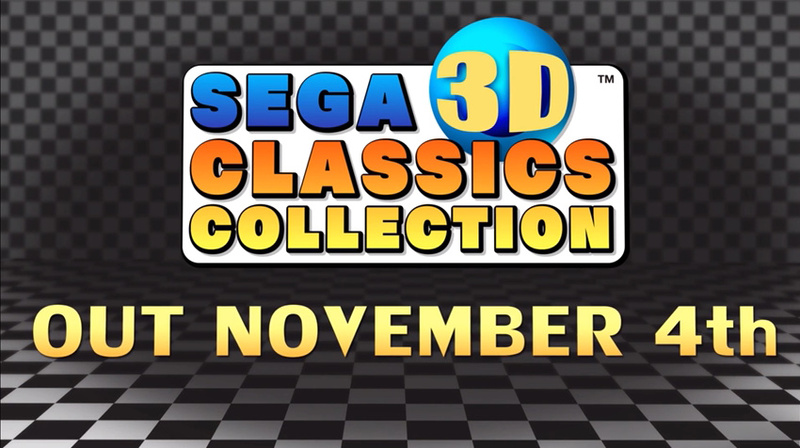 Earlier in the week SEGA Europe teased the announcement of the region's release date for SEGA 3D Classics Collection, an excellent 3DS title that combines nine (10 with a fun bonus) games from the series. Four of those titles are new to the West, while the remainder have previously had eShop releases. These 3D Classics are terrific on their own, but this collection is certainly tempting. We gave it a whopping 9/10 in our SEGA 3D Classics Collection review. The SEGA Central video below has the announcement at the start, and the hosts indulge in some self-deprecation, acknowledging that some of their E3 shows weren't particularly well received. Good to have a firm release date for this. Not sure that I will get it straight away becuase I have a lot of other games still in their cellophane. Will buy and may buy quickly as I wonder if this one may have a small production run. Wish it was all the 3D Classics as neither Shonobi III or Gunstar Heroes are included. I'll hold off, would rather get Paper Mario then the Pokemons. Gotta spend carefully. Better late than never! Anything with Puyo in is a must! I'll be buying, I've only got galaxy force 2 in that lot. I own it. It's great and worth the cash. I bought all of the classics as they came out on eShop. Is it worth buying this still? How much extra do you get if anything? Why does all the good games release in the end of the year? @tigermask 4 of the games on the comp have not been released on the eshop and are exclusive to it. I guess it's up to you. I really want sonic 3 and Knuckles for my 3DS... Recently picked up the 3D versions of 1 and 2 - would love to complete the set. I was hoping this would have the whole trilogy... I still may pick it up though. Finally! And at least Sega will giv us an opportunity to buy physical copy. Oh man, HOW I WISH MEGAMAN COLLECTION! for 3DS. @Dakt why would it have fantasy star when m2 hasn't done a conversion of fantasy star? @tigermask It was worth it for me just for Power Drift and Maze Walker (I will always know as Maze Hunter 3D). Like you I already own most of these titles already. If you get it you can always delete those titles from you 3DS and play then from the cart if you are running low on space. It's a shame it doesn't have Outrun & Sonic 2... hopefully there will be a 2nd volume. I'll still 100% buy this as soon as I get my new 3DS, whenever I get round to it. If they released a version with Outrun, Sonic 2 + S3&K and the 3 Streets of Rage games, I would actually buy a console immediately specifically for it! Nice that you guys are finally getting that, as its a very good game compilation but it's completely unnecessary and unfair that they made you wait so long. Game companies should simultaneously release games globally. Finally! Love the M2 3D classics games, will definitely be picking up physically. @samuelvictor no chance sadly! Japan got 2 volumes but we seem to be skipping the first one. Sadly I don't think there will be any more M2 games for the 3DS but I guess we've got to be happy that we got as many as we did. @tigermask It's all about Power Drift, I could give or take the other extras to be honest. It'd be nice to play the original Fantasy Zone II although I imagine it pales in comparison to II W.
Didn't the guy in charge of these 3D Classics pass away? I doubt we'll be getting any more SEGA 3D games, unfortunately. @samuelvictor at least we can play them digitally via the eShop! My favourite's have been Fantasy Zone II W and Super Hang-On. Well worth picking up. I have been waiting so long for this, so yes, i will be getting this the moment it is released. It looks like the gameshop here is not going to have it, as i still can't pre order this, so it may be a e-shop purchase! Even while i have all of the games on it, Power Drift alone makes it worth the asking price! The rest is just a big bonus, and like someone said, i could now erase the games i allready have, and play them on the cartridge if i still can get hold of a physical copy! Nice i didn't get any of those games. Doesn't seem to have been released physically... what's going on Sega! ?